Two years ago Spotify introduced Discovery Weekly, a playlist compiled every Monday with two-hours of personalized music tailored specifically to a user's musical taste. The feature combines the musical preference of the listener with popular songs enjoyed by other Spotify users, resulting in a unique mixtape full of new discoveries. Discover Weekly appeared to be an instant hit, reaching 1.7 billion streams in between July and December of 2015. According to Spotify, the number of users that enjoyed this feature has grown exponentially. In 2016, 40 million people who had streamed over 100 million songs enjoy the curated 30 tracks each week. 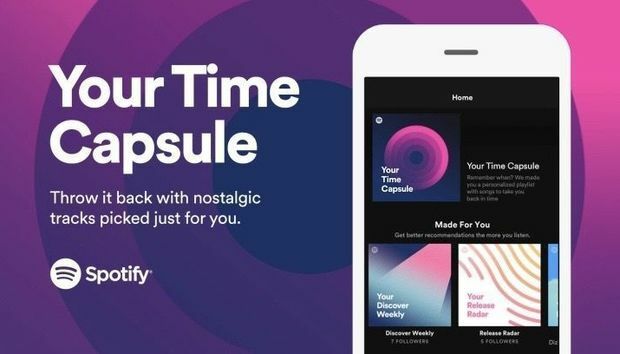 Spotify has just introduced its newest personalised playlist, Time Capsule, that takes listeners back to their teenage years. Similar to the makeup of Discover Weekly, Time Capsule analyses a Spotify member's music preferences and age, then pulls 30 iconic hits from their teens and early 20s. This nostalgic twist on Spotify's hit music discovery algorithm is accessible in three different ways. Ready to relive your teenage years?! Read on. Once logged into your Spotify account, the simplest way to find your Time Capsule is simply to search 'Time Capsule' in the search bar. Your Time Capsule should appear as your top result. You can also find your Time Capsule playlist in the 'Decades' section. Time Capsule doesn't appear outright, like some of the other customisable playlists. Within Decades is your personal Time Capsule playlist. Lastly, if you're using the browser version of spotify, you may access your Time Capsule by visiting https://timecapsule.spotify.com. If you are currently a teenager or haven't been a Spotify member for at least two weeks, this new feature is unfortunately unavailable to you. Two weeks gives Spotify enough time to analyse your music preferences and generate a collection of throwback hits that they think you'll enjoy. The longer you've been a Spotify user, the better the app is able to create a playlist to your liking. According to Spotify, 15 years and below doesn't offer a large enough time period to cultivate a playlist categorised as "teen" or "early 20s". The music would not be considered a throwback, in Spotify's opinion. Though you'll be out of luck for the Time Capsule feature for a few years, you can continue streaming millions of tracks and discover new music with the Discover Weekly playlist.